Is there a better alternative to SimplEquations? Is SimplEquations really the best app in Mathematics category? Will SimplEquations work good on macOS 10.13.4? 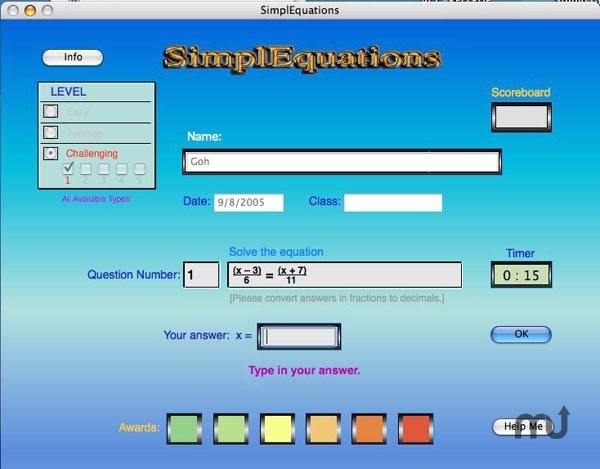 SimplEquations is for teaching and learning of simple equations and inequalities with one unknown. Tutorial with animation for easy understanding. Can generate hundreds of sums (up to 200 per session). Ideal for improvement through drills. Users can select the level of difficulty and type of sums e.g. sums with fractions, decimals, etc. Two players may compete against each other on one computer. Marks automatically and can print a detailed report after each session. SimplEquations needs a review. Be the first to review this app and get the discussion started! SimplEquations needs a rating. Be the first to rate this app and get the discussion started!